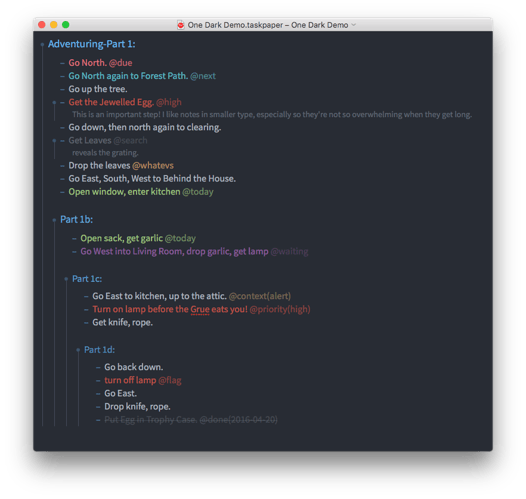 Started work on a dark theme based on Atom One Dark Syntax. Still not complete but I would love some feedback thus far. Notes are also dimmed in relation to tasks. Tags are always dimmed in relation to task text. Looks great to me. When it is ready, I’d like to look at the code. 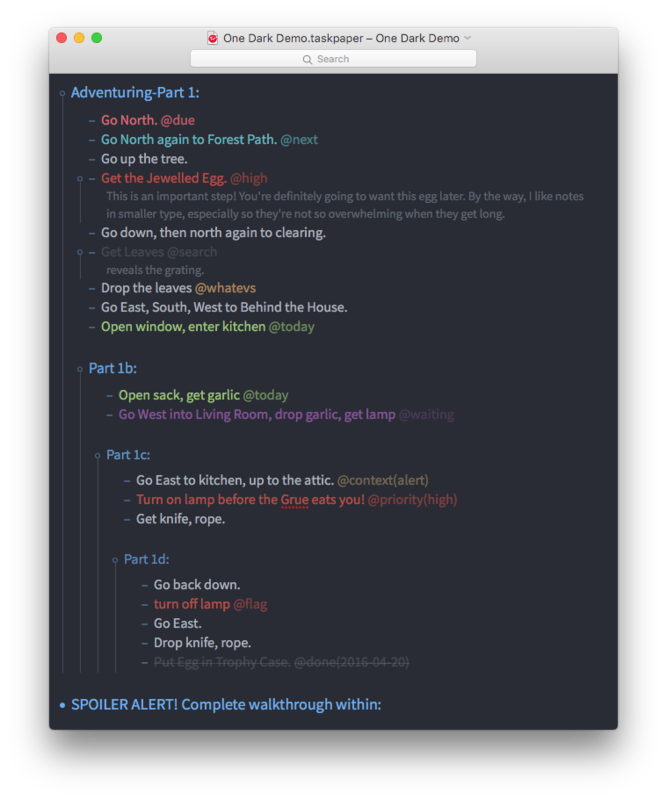 Now with the code and an updated preview. Not a less expert so pardon the code. Thank you! I’ve just bookmarked this. As I explore themes, this will be very helpful. Updated the code to reflect new styling options for the lead dash in tasks. From here on out, please follow along with code updates on GitHub Repo. Suggestions and critiques are still very much welcome here though. Hi Pedro - Thanks so much for taking on the creation of a theme based on Atom’s One-Dark. 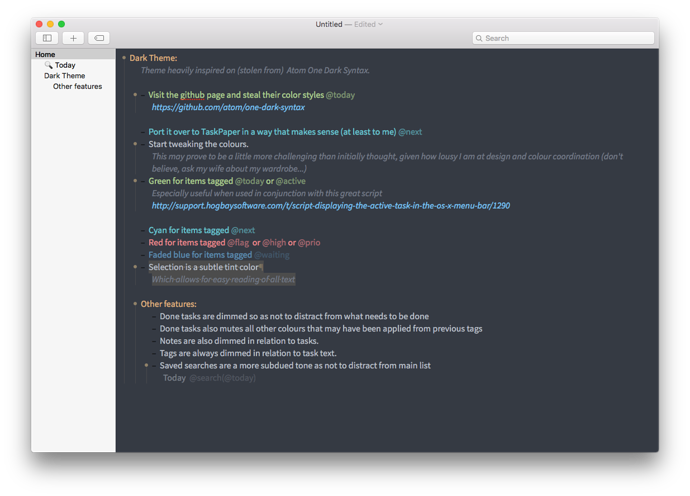 I loved that them in Atom so much I use it in Sublime Text lately too! Just had some style thoughts after recent base changes and the inspired Notes-First theme just released by pascallaliberte. I’ve made a github Fork that anyone can try out. Feel free to pull whatever you like but I’m sure you’ve already been working on updates since your last release. updated the handle tints to be in line with TP3 release style of tinting dim when not collapsed. Made even dimmer than original tint to be as distinct as possible from collapsed handles, yet still visible. borrowed the cleaner handle idea from theme-notes-first to make them invisible when there are no sub-tasks or sub-notes. Hi @jasonshanks, thanks for forking this. Unfortunately I’ve been using Linux more often at work now so until @jessegrosjean makes a version for Atom (hint hint ) I can’t use TP as often as I’d like and therefore haven’t done much more to extend this theme. I will however look into yours once I get a chance. Hi @pslobo, I understand and feel your pain in a different way. I’ve been using my iPad Pro 70% of the time lately, which has caused quite a quandary for all my excellent Mac tools like TP! Fortunately Editorial just hit public beta! No new TP enhancements yet though. I’ve done some major overhauling, updated for 3.1 and 3.2 theme enhancements, and a bit of a departure in style decisions. Let’s call this v2, hope you enjoy! Updated my fork again to account for the new handle styles introduced in 3.3. A further departure in style from the original but closer to the default theme with the open circles. Thanks for taking up the mantle of this theme @jasonshanks. Been stuck on Linux longer than I’d care for and haven’t been able to tinker with this. Looks great by the way! Hey your most welcome @pslobo and thanks! You laid a great foundation and it’s such a beautiful theme. 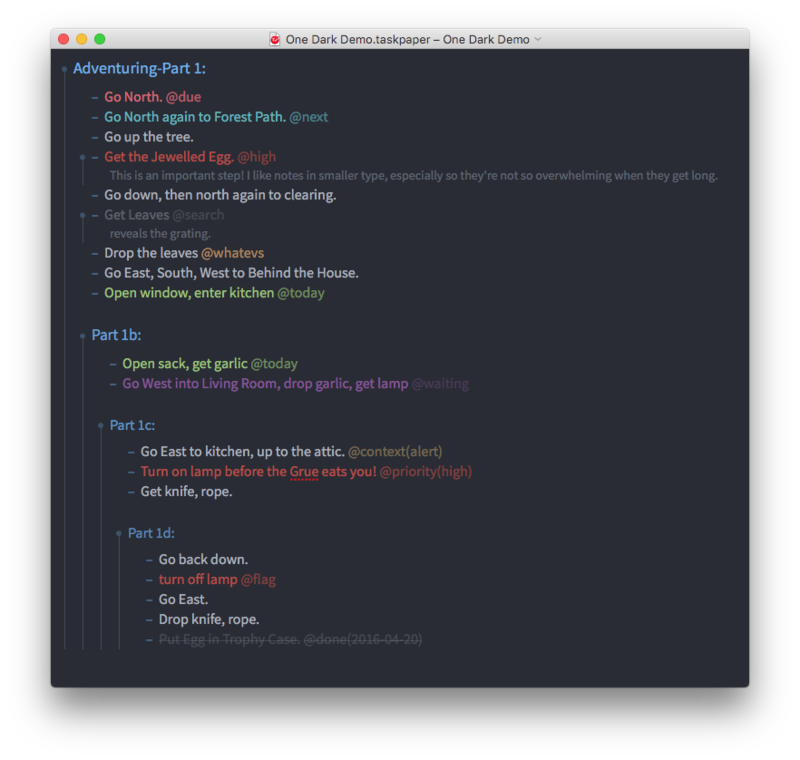 Every once in a while I waste an hour trowling through dozens of themes in Atom, eventually to just come back to One Dark. You’re welcome to merge any useful bits back into your version of course. I made some wholly subjective style decisions. In fact I’m thinking next of applying a little more LESS methodology and commenting as much as reasonable to make it dead simple for anyone else to quickly swap colours around to their liking. Yeah, I agree, One Dark is such a great color scheme. 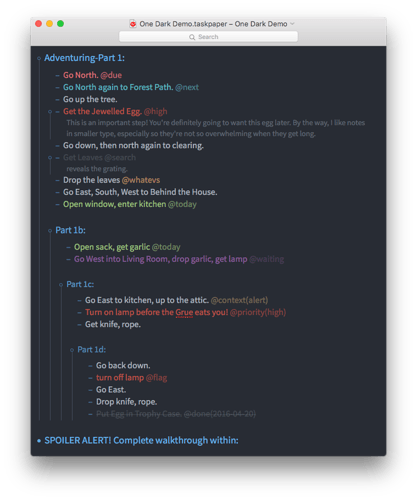 @jasonshankshas taken up the mantle of continued development of this theme/stylesheet.